Alachua, FL: Hunter Marine's new 38 cruiser enters the competitive 37'-40' market in style, featuring a completely new hull and interior, along with an all-new manufacturing process. 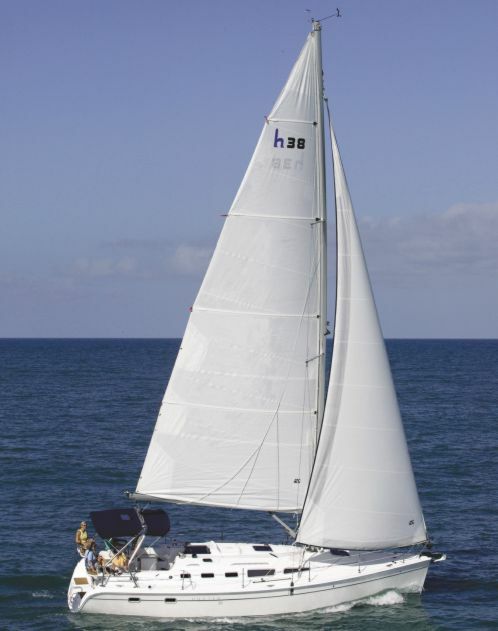 The new Hunter 38 replaces the popular 386, the last of which rolled out of the Florida plant May 27, 2004 following a highly successful seven year run. Hunter's designer and racer Glenn Henderson returned to the drawing board with one focus in mind. "Our goal was to design a boat that was an exceptionally comfortable cruiser, yet offered outstanding performance and easy handling," said Henderson. 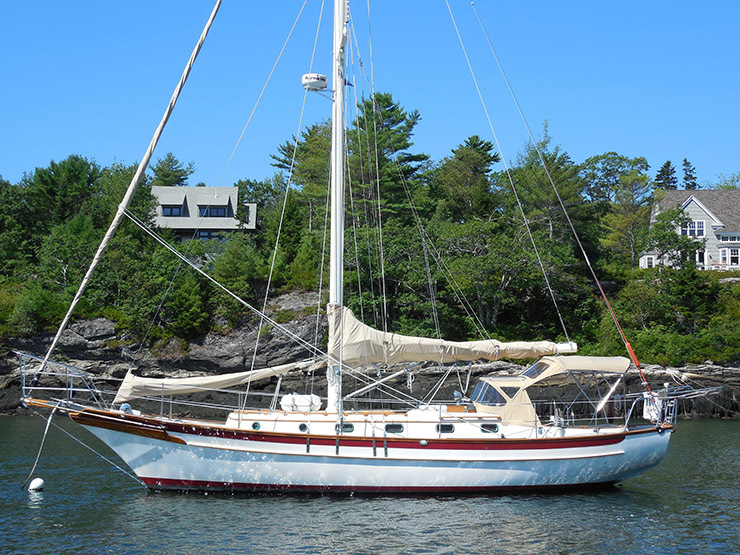 The sail plan for the 38 features a large roach mainsail with flaking system and an anodized B & R double spreader fractional rig with Selden support struts on a conventional mast. 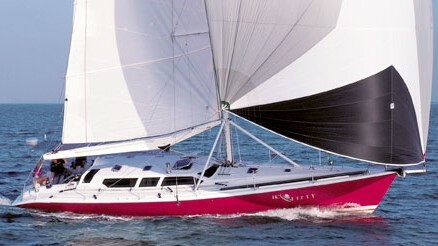 Most of the power comes from the mainsail, which Henderson prefers versus relying on a large jib. "The whole sail plan is aerodynamically efficient," explained Henderson. "I will not design a mast head rig sail plan. 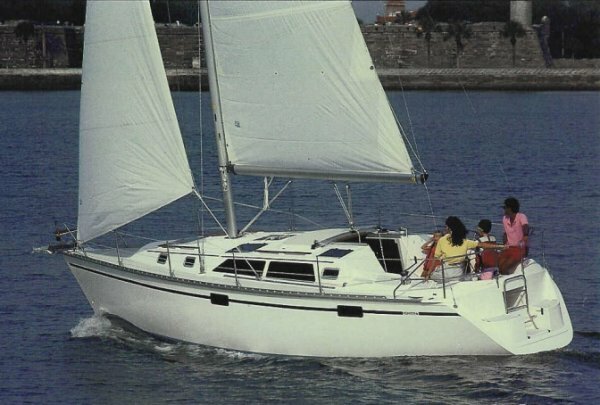 The fractional rig with large mainsail delivers better performance, and the smaller head sail means easier sail handling for both passengers and crew." HKT Kevlar is used to reinforce the low drag and robust hull. Attention was given to the volumetric distribution of the hull to even out pressures of water movement, utilizing the rudder as a major lift component along with the keel. In the past designers relied primarily on keels for lift and resisting leeway," said Henderson. "We discovered using a large rudder and smaller keel was better. The result is a more responsive boat." Stability is another key factor for Henderson because he wants his Hunter designs to be comfortable at sea. A lower center of gravity was achieved by using a new soft, durable vinyl material for the headliner instead of heavy fiberglass. The 38, he says, doesn't have a lot of pitch, doesn't pound and is easily driven. 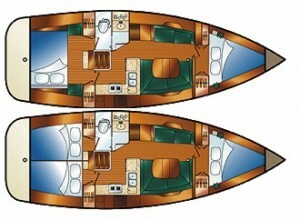 In a boat this size, interior comfort and styling is another key component to customer satisfaction. A large salon with 6'6" headroom is framed in solid teak, with an Everwear laminate teak and holly sole. The master aft stateroom features a large berth, built-in lounging seats and shelves, abundant compartment storage, and twin cedar-lined hanging lockers, while the V-berth guest suite includes two cedar-lined hanging lockers with shelves. There is also a floorplan option that splits the aft stateroom into two separate staterooms. The head includes both a private entry door from master and a hall entry, standing shower and built-in vanity. 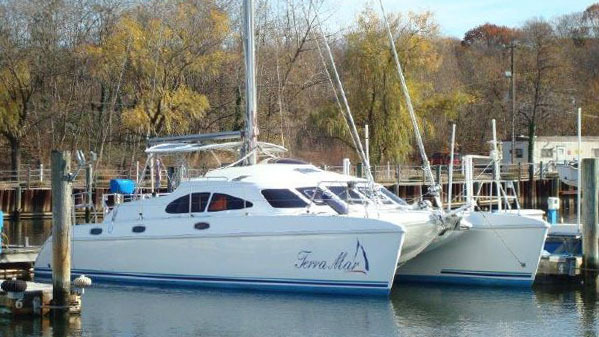 Galley standards include Corian counter tops, deep stainless dual sink, two burner stove, convection and microwave oven. A high-gloss dining table and upholstered designer-style seating converts to a twin berth for more overnight accommodations. The built-in navigation station is also provided with plenty of room for electronics. The end result is an exceptionally comfortable interior layout that maximizes living space and storage. 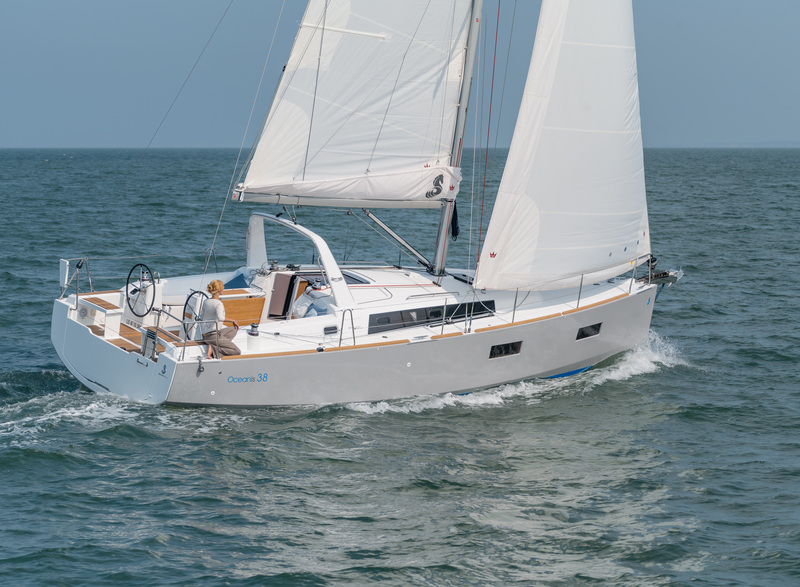 The new 38 will also feature Hunter's first inclusion of Flexiteek, a sturdy composite PVC material with the rich look and feel of teak, but without the time, hassle and expense of maintenance. Flexiteek is used in the cockpit, cabin floor, seats and transom, and not only has aesthetic value, but Peterson reports it also makes the boat a lot quieter. Since the 386 was originally designed and constructed, Hunter has advanced its manufacturing process, primarily through the uses of computer-controlled jigging and modular construction. 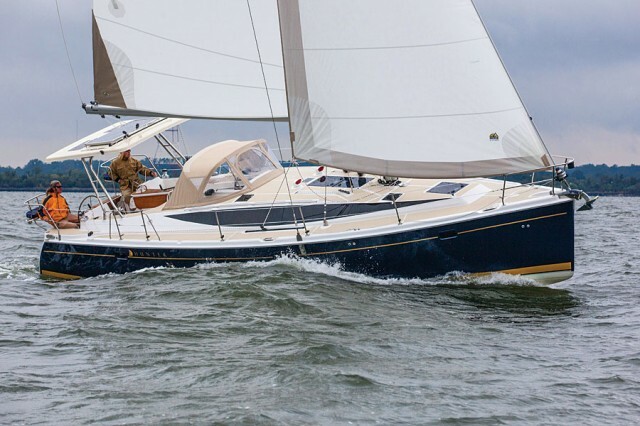 These refinements mean the 38 will have a more consistent and precise fit The Hunter 38 will make official worldwide debut at the 2004 Annapolis Sailboat Show, with dealer delivery slated immediately thereafter. 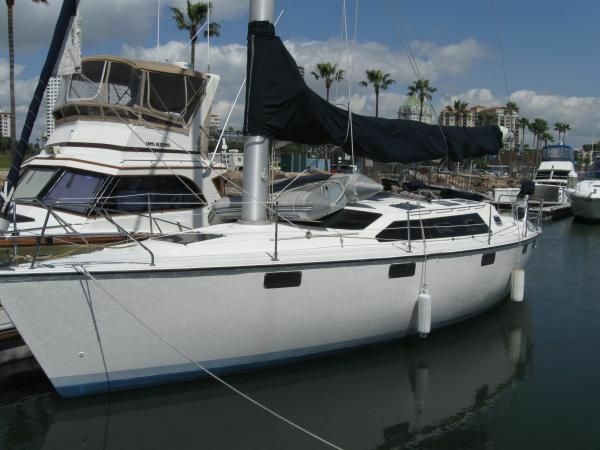 Hunter Marine is the largest sailboat manufacturer in North America and part of The Luhrs Marine Group, an Employee Ownership Company. With facilities in Alachua, FL, East Lyme, CT and Portland, England, Hunter Marine distributes sailboats from 9 to 46 feet in over 46 countries throughout the world.